Tim Lebbon – horror and dark fantasy author » Blog Archive » A Year of Challenges — half done! A Year of Challenges — half done! 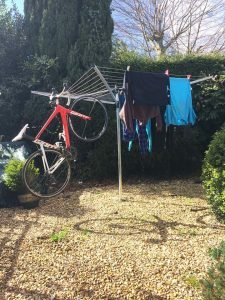 Those who pop along here regularly will know that I do enjoy the occasional horrific challenge, such as an Ironman triathlon or running up and down mountains. I do it for fun. I also do it for charity, and this year I’m raising money for DKMS (Delete Blood Cancer) in memory of a dear family friend we lost last Christmas. I’m aiming to raise £2,000, and I’m almost halfway there. I started off in January with a 50 mile bike ride. It doesn’t sound much, but coming out of the winter it was hard, cold, and it got dark very early! A tough one because of that. Job done. In February it was time to hit the trails for the Hoka One One trail half-marathon in Margam Park, South Wales. A lovely race, the weather was nice, if a bit misty. It’s by no means a PB course, with lots of climbing and muddy trails, but that’s the sort of running I love. 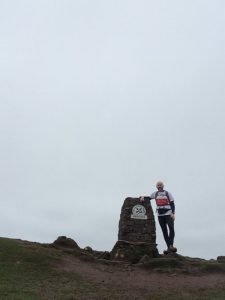 In March, I went off-piste a bit and undertook a mountain (almost) marathon. Only 22 miles, but tough enough to warrant the term! I undertook the local Monmouthshire 3 peaks, a 22 mile route taking in the Blorenge, Skirrid and Sugarloaf mountains. It was really tough, but it was great doing something a little different, including navigating and carrying enough food and water for the whole challenge. I loved every minute of it, and hope to do it again soon. April was a full month challenge, in which I rode 400 miles on the bike throughout the month. I must admit, the final weekend was a long ride on Saturday, and then a 30 miler on Sunday to make up the miles! Good fun, and good for my triathlon training. And May was the first tri of the season, the epic Blaenafon Triathlon. 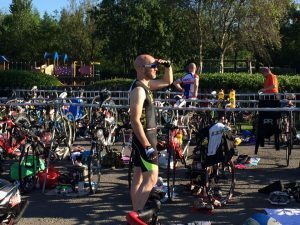 It’s the longest running triathlon in the UK (about 34 years now, I believe), and it’s renowned for being really, really hard. The easy bit is the pool swim, then it’s on the bike for 28 miles of mountains roads. Once off two wheels and onto two feet, it’s a 9 mile run all the way to the top of the Sugarloaf mountain and back down again. A scorcher, painful, hard work, and damn right I’ll do it again next year! 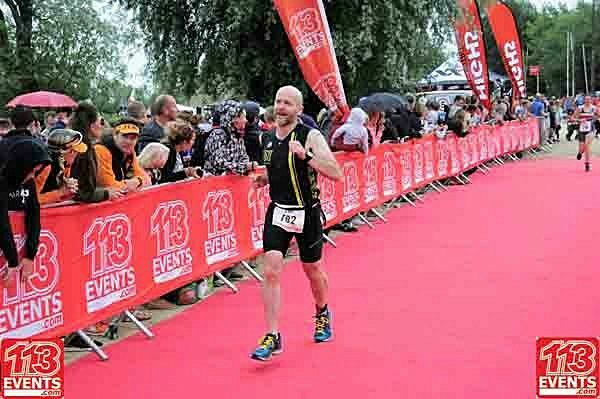 June brought an easier, flatter triathlon, the brilliant Cotswolds 113. It’s a half ironman, almost completely on the flat, and I was thrilled with a time of 5:27 (I’d aimed to go sub-5:30). Great fun, and wonderful support from my friends in the might NEWT (Newport and East Wales Triathlon) club. So that’s the first 6 months of my Year of Challenges done. Looking to the future, the next six months will bring the Velothon Wales, the Brutal Half (a half ironman … with a run up and down Snowdon), as well as other events I have yet to decide upon. But at least one of them will be a trail marathon to round off the year. Here’s when I ask for your help. I admit that I’m doing these events because I love them, but I’m also very keen to raise money for worthy causes. I’m still determined to raise £2,000 for DKMS, so if you’d be kind enough to donate you can visit my page here and do so. Here I am, looking forward to giving you the full 12 month roundup at the end of the year!